Hello, sorry I have been away for a while and have not had the opportunity to read, much less comment. Nina's mom had neck surgury and afterwards was unable to move her right side. She is in rehab now doing better, and we traveled to see her, which has kept us both preoccupied for the last couple of weeks. I am so far behnd on Ana's advent calender that it still seems like early December! I cannot believe it is so close to Christmas! Today I decided to write a light hearted post about a subject we are all familiar with. I suspect from the title you are thinking spanking....well nope. I am talking about the recurring male/female dynamic regarding the position of the toilet seat! Leave it up or down, that is the question. It takes no more effort to raise than to lower, so I wondered what was the big deal? I believe the axiom never judge another until you have walked in their shoes. So I decided to conduct an experiement. I picked a day and everytime I went to the bathroom, all day, I sat! Gracious me girls, but what a pain in the a$$! :-) The extra effort to remove and then restore one's attire is a lot more trouble than it seems. I understand now how one more step in an already multi-step process is just plain irritating! I offer a challenge to any males to give it a try. Makes you really appreciate the simplicity of our anatomy! OK, I suspect about now a few of you girls are thinking, yep, God made it simple to match everything else about guys! :-) Maybe so, but then......why do girls always go to the restroom in pairs! Lets just all say "whatever"....and thank the Lord for our differences!!! Yes, George, Vive le difference! Merry Christmas to you and Nina, too! Thanks for a cute post George. ;) Hope Nina's mom recovers soon. Merry Christmas to you and Nina! LoL George and kudos to you for experiencing to experience things from the other side of the fence :) I Hope Nina's Mom recovers quickly. I love the toilet seat debate! We have three toilets with seats that are meant to shut slowly after you have used the loo. Which is great for the men of the family as they don't have to do more than just let them go, and great for the woman of the family as the seats and their lids are usually shut - BUT - the two of the stupid things won't stay up! That means that the men have to crouch and hold them up whilst peeing! Can you see a problem here?! And when my young grandson visits, he can't manage to do that, and usually ends up peeing all over the rapidly closing seats! LOL! 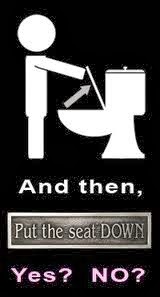 But normally my men are very good, and at least leave the first half of a toilet seat down. I only leave the lids down as well, because they looker nicer that way. Sorry to hear about Nina's mum and I hope she gets better quickly. Merry Christmas and a Happy New Year to you both! George, you are a gem among gems! The next time we are at a service plaza on the highway, when we both use the restroom and when I come out and my husband asks "What were you doing in there? "...then I am sending him to read this post. Okay FIRST OFF...you answered your own question, sort of. We go in pairs because there is almost ALWAYS a line up ( as we have to disrobe to pee) so we have someone to talk to while we wait. In our house I do exactly as in the duck picture. I am the only female in our house, save the dog, and well she's no help! I leave the seat up after I am done. 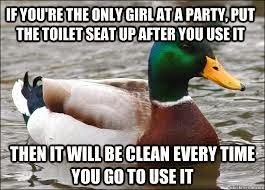 Sadly however the 'men' in our house do have an occasion to put the seat down, and THEY leave it down. I will let you in on another secret you really could live without ever knowing, because I am a great friend that way, IF you are unfortunate enough to sit down on a wet seat, you have NO clue until you stand back up! BLECH. Of course there is also the middle of the night falling INTO the toilet because you thought the seat was down. OR sitting ON a closed seat! That is so jarring!! Even more so now since starting ttwd. Okay so there you have it, more about the toilet that you ever wanted/needed to know. Merry Christmas my friend. All the best in the New Year!